Preheat the oven to 180°C. Prepare a baking dish with a tablespoon of oil. Add the tomatoes and peppers to the dish with a drizzle of balsamic vinegar. Bake for 5 minutes. 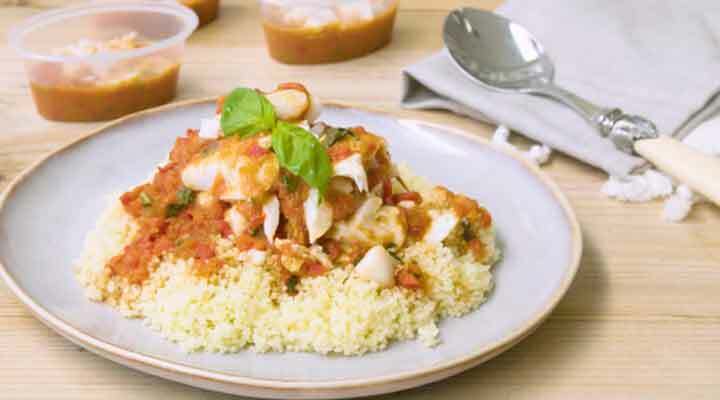 Remove from the oven and rub the cod fillet over the tomato pepper mix. Squeeze over the lemon juice and the rest of the oil. Sprinkle over the basil leaves and return to the oven. Bake for a further 15 minutes, until the fish is cooked through. Transfer the vegetables to a food processor and blitz to make the sauce. Serve with some pasta with the fish flaked over the top. Suitable for your weaning baby from 6 months. Simply blitz the sauce to the desired consistency and serve as a finger food with a dipper such as pasta or pitta bread. Ensure to check the fish thoroughly for bones before adding to the sauce or serving to baby.